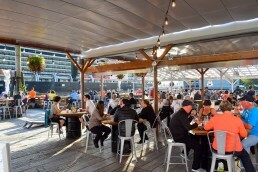 Whether building a new patio space, expanding the current footprint or looking to modify the existing seating plan, the intent is likely the same – increase revenue and restaurant profit. More seats = more capacity = more patrons. It’s a simple concept. But, there are underlying variables often overlooked when putting the master plan together. Increasing seating capacity is the first step to success. But, if those seats are exposed to excessive UV rays or drizzling rain, they will remain vacant. 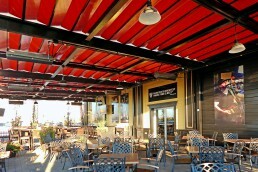 Overhead protection is crucial for providing the level of comfort patrons expect as they dine. It’s also a way to extend the patio season in both the spring and fall. Depending on location, properly planned overhead protection paired with heating, can add 10-12 weeks of patio season annually. Beginning a project that involves expansion or enhancement can be overwhelming. With so much on the go, the argument ‘the money can be spent elsewhere’ often comes up. Replacing cutlery, additional entertaining, new signage, the list of “it would be nice to” probably goes on forever. However, understanding the perceived value and return of these investments are subject to scrutiny. If the flavours of the food are magnificent the fork probably doesn’t matter. If the game is heading into overtime, does it really matter if it’s on a 55” or upgraded 4K 60” television? The point is, the foundation of why people pick a location over another is already established. Investments that allow a table to turn over five times on a Saturday are going to pay back exponentially, and at a greater return than the new neon sign above the door. Before jumping into a big investment, it’s important to understand the timing of return. This exercise can get very detailed. To keep things simple, we’ll review the main drivers and inputs that determine how much additional revenue is available with protected seating. We’ll also calculate the anticipated time it’ll take to pay back the investment, and the ROI % over fixed periods. Let’s start with some basic restaurant lingo. Revenue per seat is the average spend per seat at a restaurant. To determine revenue per seat, take the total sales in a period of time and divide by the total number of seats. It’s worth noting there is a built-in assumption that all the seats are occupied over the period. For example, if the restaurant has 40 seats and total sales between 7-9pm is $1,400. The revenue per seat is $35. Table turnover ratio is the number of times during any given service the table flips. I.e. how many times the table becomes occupied by a new party. For example, if the restaurant has 40 seats across 10 tables and hosts 80 guests over the dinner service, the table turnover ratio is two. Now that we have covered the basics, let’s walk through an ROI example. 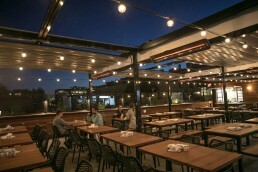 Restaurant XYZ invests $100,000 to protect 10 tables on their patio. The 10 tables allow for seating of 40 patrons. 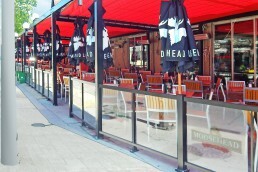 It is anticipated the investment in overhead protection will extend the patio season by 10 weeks, adding 70 extra days of service per annum. The average revenue at Restaurant XYZ is $35 per seat, and the tables turn over twice during dinner serving. Applying a conservative 250% mark up on ingredients, Restaurant XYZ not only pays off the entire investment in the first year, but it will also yield an initial return of 17.6%. Applying the Annual Gain from Investment over a 5-year period, the Return on Investment is 488%. Applied over a 10-year period, the Return on Investment is 1076%. The analysis above is not all-inclusive. There are assumptions applied, such as always operating at capacity, and a flat 10 weeks of gained patio season each year. These assumptions will accelerate the pay-back period and ROI%. Having said that there are also variables omitted. Such as the additional days lost due to inclement weather, and a fixed table turnover ratio of two. Patio tables can turnover four to five times a day on the weekends. The big take away here is every patio will have its own set of inputs, and variables. Calculate your anticipated additional revenue, return on investment, and payback period below. Before jumping into the exercise, consider the following. Mark-Up: Select a range that represents your most popular dishes. Table Turnover Ratio: Consider the variation between weekdays and weekends. Extra Number of Days: Combine extended patio season in spring and fall, with the days that would have been lost due to inclement weather. Protect your patrons, patio and pockets. Contact us today.